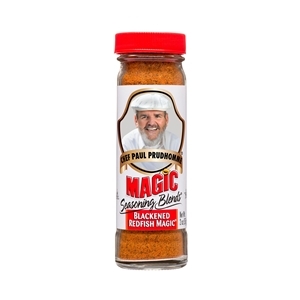 One taste of a dish prepared with this blend, and you'll understand how all the "Magic" got started! Chef Paul's now world-famous Blackened Redfish Magic captures the essence of Southern Louisiana cuisine and works wonders on any kind of fish, no matter how it's prepared! For a taste you won't forget, try sprinkling it on shrimp, crab, oysters, lobster, catfish, etc. Fantastic in your gumbos, soups, sauces, and dressings. (To use, simply substitute for salt, pepper, and other herbs & spices in your recipe.) No Preservatives MSG-Free and Gluten-Free Kosher and Halal approved.